Another simulated blast from the past, this time featuring four newly-produced stories set in the 1950’s, all written and drawn by Bill Black, staring his revamped version of The Fighting Yank.There’s “The Man Who Lived Twice”, starting off the ‘Yank’s battle with the villainous Communist operative known as The Panda, and guest starring Dr. Jonathan(Purple Claw)Weir.Then, it’s “Enter Kid Quick”, where FY takes on a young partner in an attempt to take a bite out of The Panda’s hulking drones, The Doughboys. Next, it’s “The Desert of Deadly Disks”, as The ‘Yank and The Kid’ try to kick The Panda’s big Butte. ( Guest starring Captain Flash.) Then, the Panda’s pliable Doughboys try to duplicate a true original in “The Red-Hot Return Of Yankee Girl”. 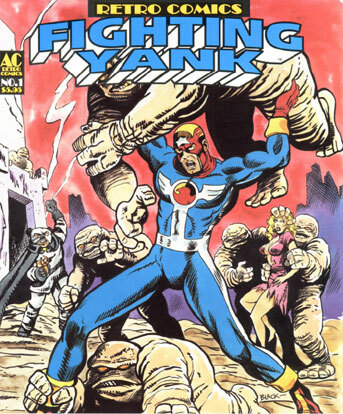 If you enjoyed Simon and Kirby’s Prize Comics classic, The Fighting American, you”ll love this. And, for the traditionalists, there’s also a real Golden Age reprint, the original Nedor/Standard Fighting Yank, tricornered hat and all, drawn by Jon Blummer, from America’s Best Comics #17. Color wraparound cover by Bill Black, interiors are black and white. 44 pages, 67/8″ X 81/2″ retrocomics size. Printed in 1997.